While watching some of the indoor cycling the other night — which we don’t always understand, but still enjoy — we started joking about what the sports would be if the Dutch had started the Olympics. We decided that the velodrome bike sports would be a competition to see not only how fast you can go around, but how many people you can fit on one bike while racing. Children would be used, of course, in order to make the most of the multiple child seats. There would also be bakfiets racing. Other competitions would involve carrying large, awkward items on a bike. Sort of like weightlifting, you’d gradually work your way from surfboards and multiple bags of groceries, up to small trees and small sofas. There could be a dressage competition for the most interestingly decorated bicycles. Finally, there could be a competition to “park” a bike in the highest and most difficult to reach position possible. 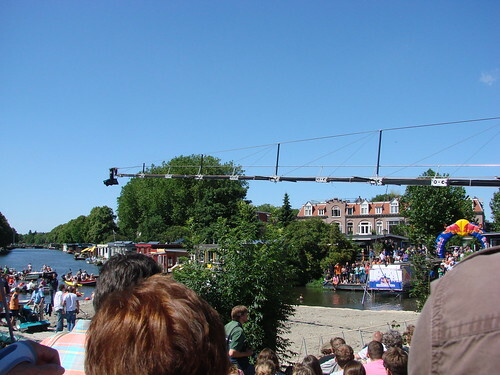 Such as far-reaching branches of a tree over a canal. What would be a funny Olympic sport representing your country? 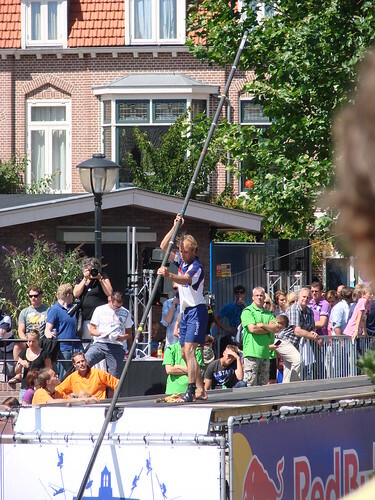 A few years ago, while watching The Amazing Race (at 4:09), I saw fierljeppen for the first time, although I didn’t know that name at the time, nor did I understand how big a sport it is here. 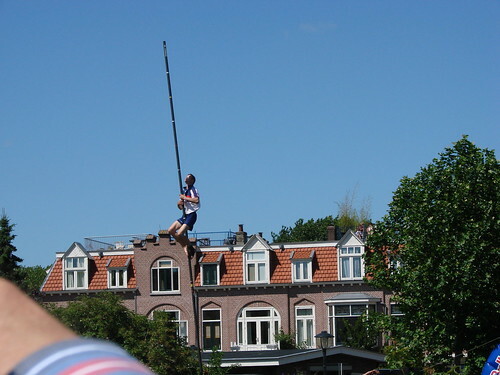 Fierljeppen is an ancient Dutch sport in which competitors using a long pole jump from one side of a canal to the other. The origin stems from farmers doing this to get from one field to another. 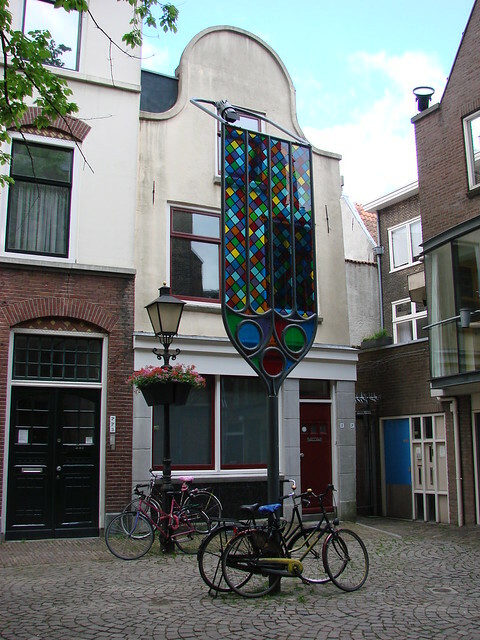 Historically, the practice dates back to at least the 1200s, when the first written mention appears. The first major organized competition was in the 1700s. 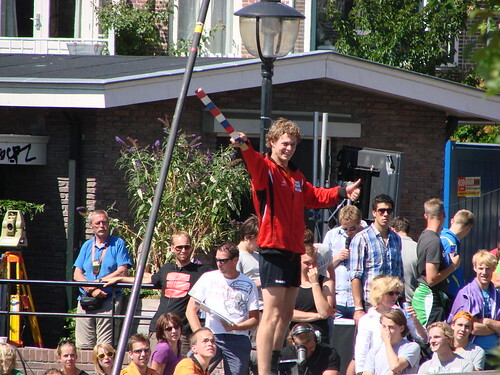 It’s particularly popular up in Friesland, which is where the term fierljeppen comes from; in other parts of the country, the sport is known as polsstokverspringen. Before you start imagining current competitors dressing in traditional costumes and everything being quiet and quaint, think again. Nowadays, there are competitions sponsored by Red Bull, with massive crowds (I didn’t get any photos that truly give you the scope of how many people were there, but according to the Red Bull website, there were 13,000 spectators and G and I were two of those. We got there about an hour after it started and stayed to see the top eight jumpers go twice, including the setting of a new world record. 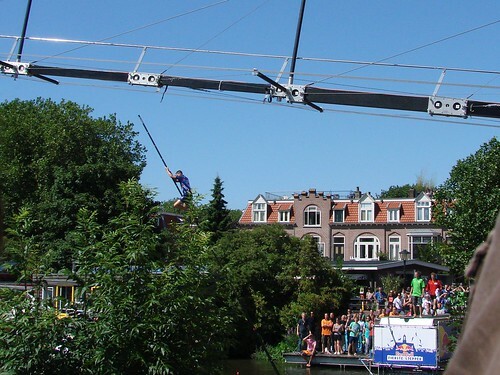 The basic idea behind the sport is to take a running jump, leaping and then climbing up a really tall pole (14 meters long in this case), before eventually (hopefully) landing on the other side of the canal. We saw a few competitors who managed to climb all the way to the top of the pole, some with better luck than others once they got up there. You’ve got to control the forward and lateral movement of the pole while you’re up there and it’s definitely much harder than it looks from all accounts. Before they jump, they get to arrange the pole, first adjusting it to arm’s length out and then with an added distance achieve with some sort of measuring stick. To be honest, I don’t know the details on this, other than having watched all the competitors do it. 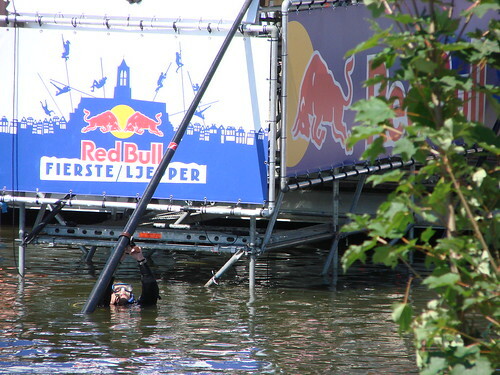 There are also divers in the water to help position the pole after each jump and to provide help to any jumpers who don’t actually land on the ground. We saw a few splashes yesterday, but fortunately, no one was hurt. 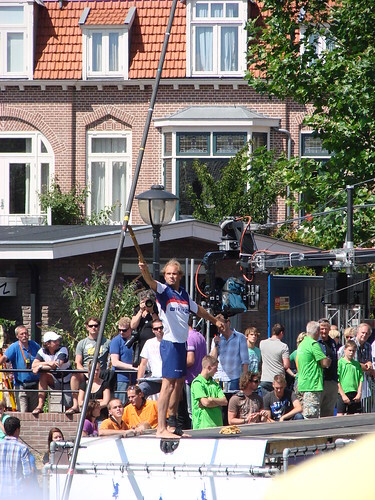 The whole event was filmed and televised, with interviewers on hand after jumps to talk to the competitors. There were also big screens on hand to show the crowd some of the different angles. I got some more photos and videos, but ultimately chose just to watch and enjoy. If the Red Bull website’s video of the event ever starts working, I’ll add a link to it. It was a beautiful day and the event was a lot of fun. I definitely recommend going to a competition if you ever get the chance. I’ll leave the jumping to the professionals, though. And the Red Bull video is finally up and working.